Local club leaders Jodi and Keith Bergkamp were recipients of the Alumni of the Year award, along with Carolyn Lowry, not pictured. The 4-H Alumni of the Year Award is awarded to past 4-H members who continue to make significant contributions to the 4-H program. 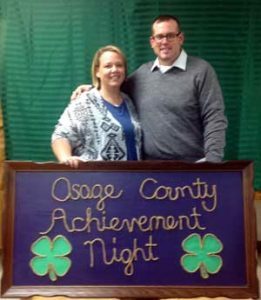 This past 4-H year, local club leaders Jodi and Keith Bergkamp and Carolyn Lowry were nominated for the award. Jodi and Keith Bergkamp were nominated for the Alumni of the Year Award by Vassar Blue Ribbon 4-H Club. Jodi and Keith were both 10-year 4-H members and are now active in 4-H with their children. Their favorite projects in 4-H were swine, sheep, cattle, foods and photography. They are club leaders of Vassar Blue Ribbon. Carolyn Lowry was nominated for the Alumni of the Year Award by the Burlingame 4-H Club. She was in several projects during her 12 years as a 4-H member, including sewing, cooking, junior leaders, and of course, horses. She attended CWF (Citizenship Washington Focus) with Osage County 4-H. In her best year at the Kansas State Fair, she was in the top five in pole bending and top 10 in barrel racing. She is a club leader for Burlingame 4-H Club.